Shadows of Brimstone: Doorways Into Darkness (OtherWorld Doorways) | Azazel's Bitz Box. 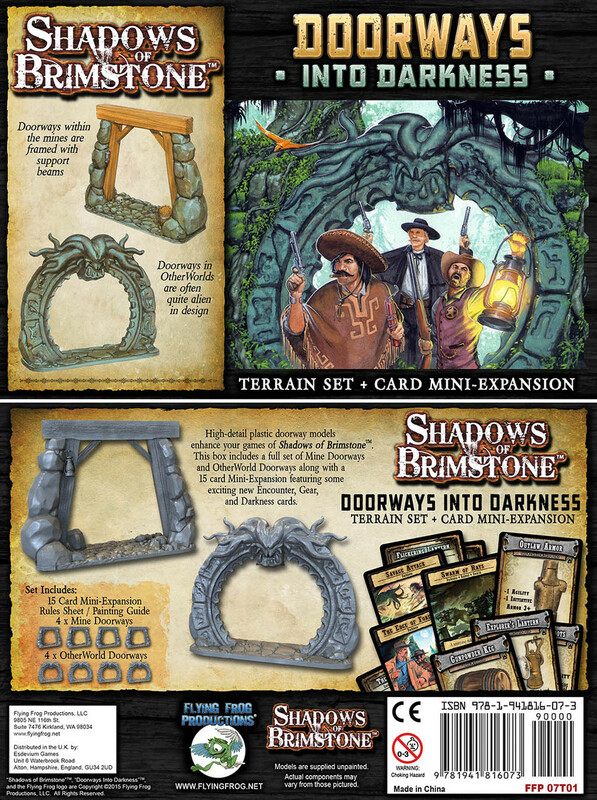 A couple of weeks ago I completed the Mine Doorways from the Shadows of Brimstone: Doorways Into Darkness set. This weekend, I painted the other half of that boxed set – the OtherWorld Doorways. Once again, they’re pretty simple models, but nice enough for what they are. 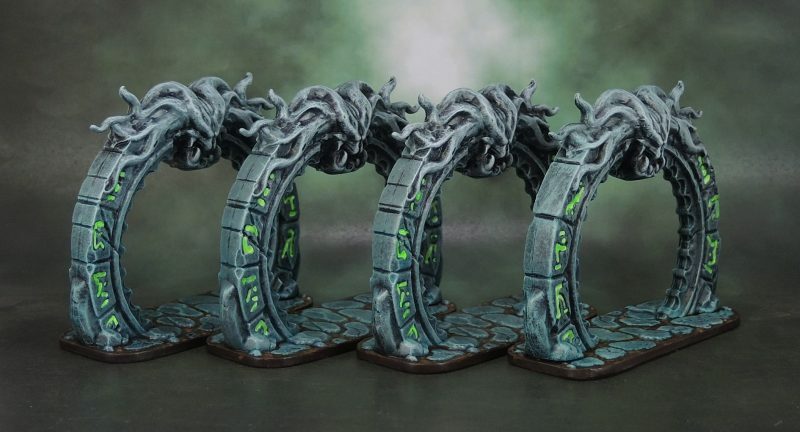 I took some inspiration from their suggested painting guide insofar as the greenish hue to the lower parts of the portal-like doorways, though I decided to paint the runes in a bright (glowing) green. I didn’t bother with OSL effects, because they’re good enough as is for boardgame doorways or potential wargame/roleplaying scenery items – as portals/etc. They certainly pass the four-foot test. Another boxed accessory set complete! Our scale models for the Doorways into Darkness are a trio of Conan’s Black Dragon bodyguards. 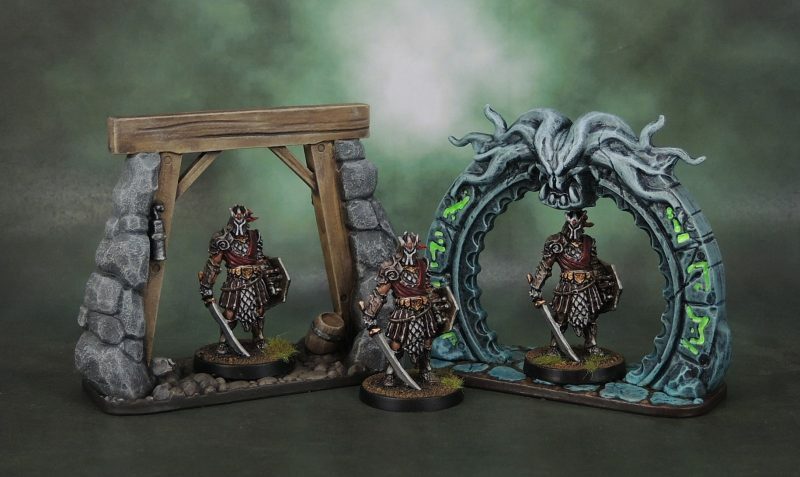 This entry was posted in Board Games, Shadows of Brimstone, Wargame Scenery and tagged Doorways Into Darkness, Mine Terrain, Miniature Portals, Shadows of Brimstone. Bookmark the permalink. Thank you – i have to admit that I took inspiration from their painted ones in the guide that came with the kit. I wouldn’t have thought of the gradient of green-grey for the stone arches. Simple they might be but they still need painting well. Great stuff. Thanks! If I ever get around to playing Shadows of Brimstone it’s probably going to be quite a good looking game on the tabletop! I really like those doors, all I have right now are the old Warhammer Quest doorways. To be fair, those are pretty cool as well – and I wish I had a few! Thank you Alex – they caused a little consternation as I struggled to decide what colour to paint them, but the bright glowy green seems to have worked better than too-much-contrast red. Yeah, I think they have potential to work quite well across a lot of games from the Warhams to many RPGs as well as a lot of skirmish and narrative games. I look forward to when you get back around to Conan again. I’m doing the add-on boxes before I go to the main ones – mostly because I can dispose of the smaller ones! Looking very nice and creepy! Don’t think I’d want to tangle with whatever came out of one of those! Thanks Alexis. 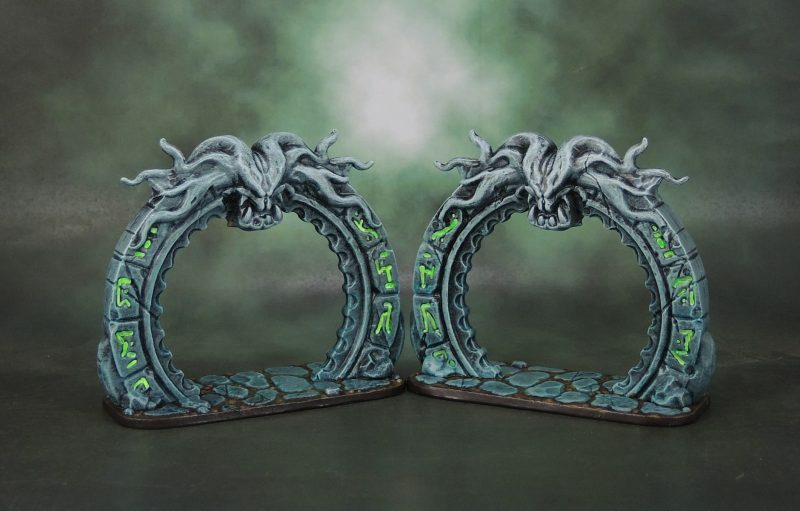 Chaos Portals for Silver Tower as well, perhaps! Damn, that’s an amazing piece of work he’s done there! Yeah, these would work really well for something like that. Fantastic work, and an effective colour scheme! Thanks mate! I’m happy with how well they turned out! Nice! Agree with above on the colors, who made the fluorescent green? I’ve been using Vallejo Mecha Fluorescent Green, is it that? it’s Vallejo Model Colour flouro green, which may well be the exact same stuff as Mecha. Unfortunately, now you’ve let me know that the Mecha paints are a thing that exist, so I’m going to have to see what’s available there and no doubt buy some! They are designed for airbrushes, but I also use them for brushwork. Nice and thin. Sounds similar to Model/Game Air. I’d guess the consistency would be much the same as the existing Air ranges (they are, after all, designed for Airbrush) but with a more Gundam-oriented choice of palette aimed at that market, as you say. Great job on those. Seeing them next to your models though, really shines. I’d swear that pic was an ad from a magazine. I just checked my Paint app, and looks like I don’t have that fluorescent green. Odd, because I know I have something similar. I do have VMA Fluorescent Air, and it was crap for brushing on. I guess it might be good for some spot red glowy effects, but I can’t imagine loading up my airbrush just for that.